A dark matter experiment scheduled to go online at the Canadian underground laboratory SNOLAB in the early 2020s will conduct one of the most sensitive searches ever for hypothetical particles known as weakly interacting massive particles, or WIMPs. Scientists consider WIMPs strong dark matter candidates. But what if dark matter turns out to be something else? After all, despite an intense hunt with increasingly sophisticated detectors, scientists have yet to directly detect dark matter. That’s why researchers on the SuperCDMS dark matter experiment at SNOLAB are looking for ways to broaden their search. And they found one: They have tested a prototype detector that would allow their experiment to search for much lighter dark matter candidates as well. The collaboration published the results of the first low-mass dark matter search with the new technology in Physical Review Letters. Some scientists on the team also described the prototype in an earlier paper in Applied Physics Letters. The core of the SuperCDMS experiment is made of very sensitive detectors on the top and bottom of hockey puck-shaped silicon and germanium crystals. The detectors are able to observe very small vibrations caused by dark matter particles rushing through the crystals. The challenge in using this technology to find light dark matter particles is that, the lighter the particle, the smaller the vibrations. The vibrations caused by a dark matter interaction can also dislodge negatively charged electrons in the crystal. This leaves positively charged spots, or holes, at the locations where the electrons once were. If an electric field is applied, the pairs of electrons and holes traverse the crystal in opposite directions, and the detector can measure their charge. One way of making the experiment more sensitive is to increase the efficiency with which it measures the charge of the electron-hole pairs. This approach has been the major factor in improving sensitivity until now. The predecessor of SuperCDMS SNOLAB—the SuperCDMS Soudan experiment, housed in the Soudan mine in Minnesota—required the charge from 70 electron-hole pairs to make a detection. SuperCDMS SNOLAB will require just half as much. “But that’s not the type of improvement we did here,” says Roger Romani, a recent undergraduate student in Blas Cabrera’s group at Stanford University and lead author of the Applied Physics Letters paper. The team found a different way to make the experiment even more sensitive. “In our approach, we counted the number of electron-hole pairs by looking at the vibrations they caused when traveling through our detector crystal,” he says. To do so, Cabrera’s team, joined by Pyle and Santa Clara University’s Betty Young, applied a high voltage that pushed the electron-hole pairs through the crystal. The acceleration led to the production of more vibrations, on top of those created without voltage. 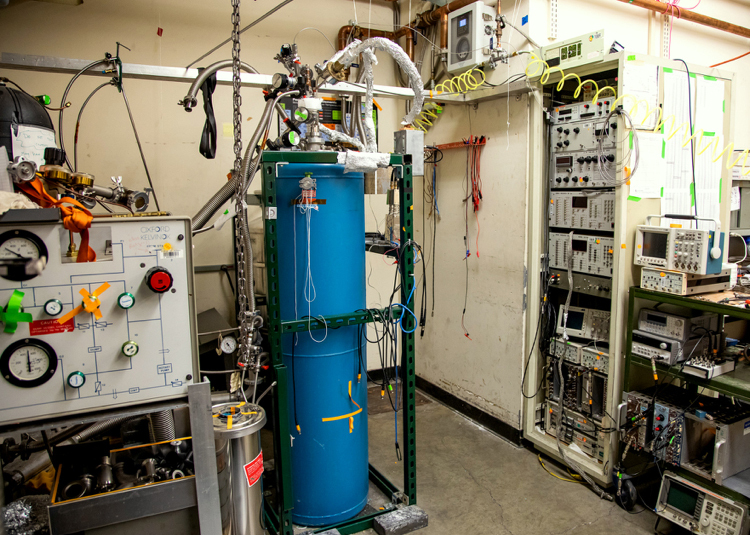 This refrigeration unit in the Cabrera lab at Stanford keeps the experiment’s detector crystals at nearly absolute zero temperature. The SuperCDMS collaboration has used the prototype detector for a first light dark matter search, and the outcome is promising. “The experiment demonstrates that we’re sensitive to a mass range in which we had no sensitivity at all before,” says Cabrera, former SuperCDMS SNOLAB project director from the Kavli Institute for Particle Astrophysics and Cosmology, a joint institute of the Department of Energy’s SLAC National Accelerator Laboratory and Stanford. The result is even more compelling considering the experimental circumstances: Located in Cabrera’s lab in a basement at Stanford, the experiment wasn’t shielded from the unwanted cosmic-ray background (SuperCDMS SNOLAB will operate 6800 feet underground); it used a very small prototype crystal, limiting the size of the signal (SuperCDMS Soudan’s crystals were 1500 times heavier); and it ran for a relatively short time, limiting the amount of data for the analysis (XENON10 had 20,000 times more exposure). Eventually, the researchers want to scale up the size of their crystal and use it in a future generation of SuperCDMS SNOLAB. However, much more R&D work needs to be done before that can happen. At the moment, they’re working on improving the quality of the crystal and on better understanding its fundamental physics: for instance, how to deal with a quantum mechanical effect that randomly creates electron-hole pairs for no apparent reason and can cause a background signal that looks exactly like a signal from dark matter.